Leeds GovJam is a chance to learn by doing.Your team will collaborate rapidly in designing and testing solutions to public problems. You’ll get more than great new ideas and service design methods: by the end of the event you will have the experience of co-creating a working prototype. GovJam is a global event which applies tools and techniques of service design to the world of government and the public sector. Working around a common theme, small teams meet at multiple locations to prototype innovative approaches to challenges faced by the public sector. At the end of the two days, they upload their results and publish them for the world. Thursday 2 June, 9am to 5pm: More testing and making up to 3pm when everyone shows what they’ve made and shares their work online with a Creative Commons License. It’s for anyone and everyone with an interest in public services and making them better. 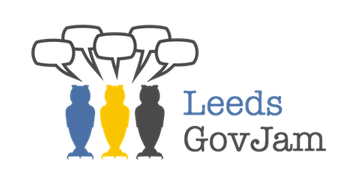 Leeds GovJam brings together people working in local authorities, the NHS, national government departments, as well as the private and voluntary sectors. What they all have in common is a curiosity to try new ways of working together around public sector opportunities and issues. We hope you’ll join the jam! We are very excited to be hosting the global HQ team in 2016.